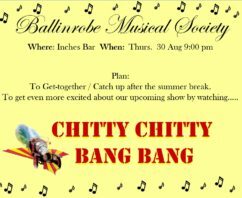 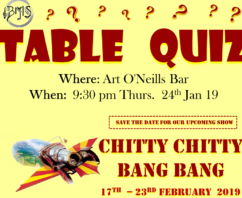 Posted on January 10, 2019 by Tracy Hennelly in "Chitty Chitty Bang Bang 2019"
Posted on September 25, 2018 by Tracy Hennelly in "Chitty Chitty Bang Bang 2019"
Posted on September 18, 2018 by Tracy Hennelly in "Chitty Chitty Bang Bang 2019"
BMS are delighted to announce the cast list for our upcoming Show. 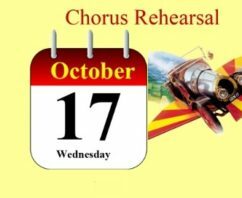 Thank you to all who auditioned. 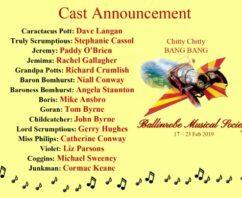 Posted on August 22, 2018 by Tracy Hennelly in "Chitty Chitty Bang Bang 2019"
Chitty Chitty Bang Bang Characters and their Descriptions can be found below. 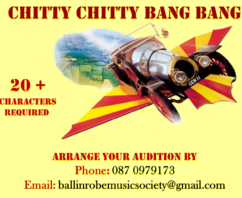 If you would like to make an Audition please contact our secretary Phone: 087 0979173 or Email: ballinrobemusicsociety@gmail.com We look forward to hearing from you.